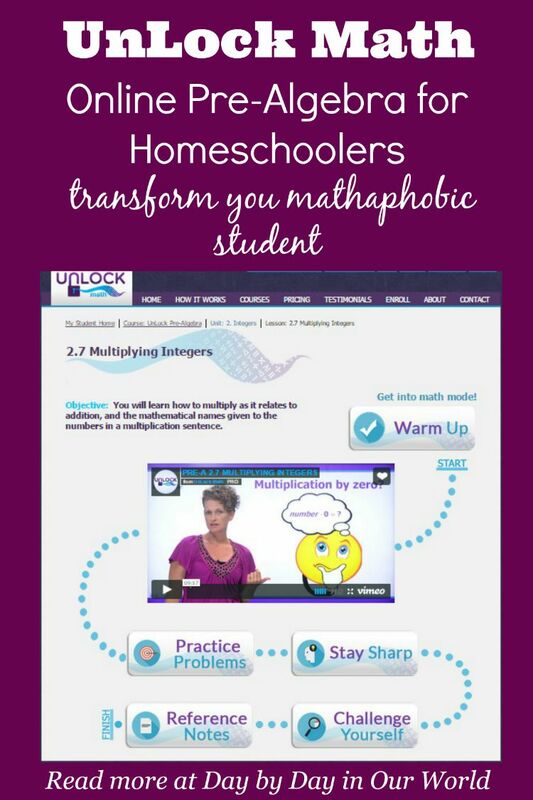 This post, Introducing UnLock Math, a New Homeschool Pre-Algebra Online Math Curriculum, was made possible with the chance to review the UnLock Pre-Algebra from UnLock Math as part of the Schoolhouse Review Crew. I will admit that I find myself a bit unique when it comes to being a homeschool mother. Teaching math for the upper levels does not evoke a feeling of terror for me. Rather, I loved to solve math problems….for fun! However, I have found that teaching the boys a subject I love does not always come easily. When you add to the equation the need to facilitate learning for so many subjects at multiple grade levels, I find myself wanting work that can be done independently most of the time. With a total of 16 units broken down into anywhere from 5 to 11 sections, students can move methodically through the material. Lessons include a warm up, video for the lesson’s concepts, practice problems, staying sharp and challenge yourself. Reference notes which outline key concepts and vocabulary to know are available as well for each lesson. Additionally, there is a wonderful formula sheet that is a great reference when working through the course. All notes and the formula sheet are available in pdf format to download and subsequently print if desired. At the end of each unit there is a review which proceeds the unit test. Review problems do not count towards the final grade, but rather provide a chance for them to go over the key concepts and flush out any trouble spots before taking the unit test which does affect their grade. Unlike a print test for many math programs, this one shows problems one at a time so that students are not overwhelmed thinking about all they have to complete. Half way through the course (after unit 8), the student is given a mid-term exam which has its own review section to help them prepare to do well. Scheduling the workload is even done for the parent as UnLock math offers a pacing guide which has the student completing the course in 32 weeks if done 5 days per week or 40 weeks if done 4 days per week. Of course, if you have a more motivated child, they might make it through the class even faster. Individual lessons can take upwards of 30 minutes, although students might move more quickly or slowly depending upon their current abilities. 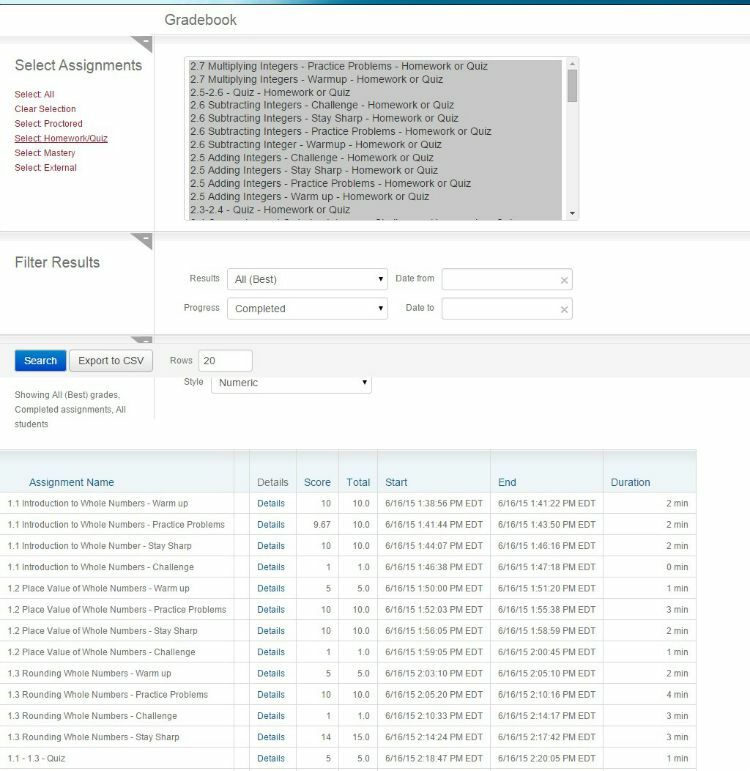 From the dashboard, you can also look at the course gradebook or a progress report for the course. From the gradebook, you can click on individual components to see the questions asked, the student answer and the correct answer. 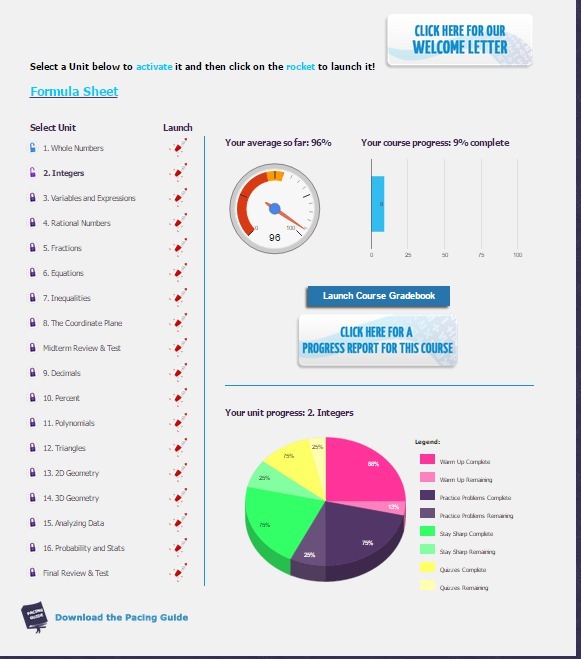 The progress report shows you an overall snapshot of where their grade is derived. So far, my rising 7th grader is approximately 9% of the way through the class. Traveling via RV across the continent led to many days without the ability to log in to the website, so he is now back at it. Sometimes he has used a laptop to access UnLock Math and othertimes he has used the Safari browser on the iPad to do the same. Overall, he has enjoyed the program and likes that you can move forward when additional practice is not needed. Videos take just a few minutes to watch and for this initial part of the class he has found the concepts to be more of a review and therefore easy to complete quickly. The immediate feedback for completed work is a bonus as he doesn’t have to wait for me to gather a teacher guide book to grade it. Plus, if he misses a problem, he can watch a thorough explanation of the solution. As a parent, I love how well thought out UnLock Math is. I can see what has been completed as well as how long each piece took for completion. While I am always available to answer questions, having this online format with a teacher presenting material and offering complete solutions to missed problems definitely lightens my overall work load a bit. I am definitely looking forward to the release of Algebra II in 2016 as my rising 10th grader will be ready for it then as will this busy homeschool mother. And, seeing that they offer will have Algebra I ready for release soon means D can seamlessly move into the next level of material when he is finished with this course. Using our affiliate link to purchase an annual subscription will let you receive $50 off the subscription price. Does teaching math for pre-Algebra and beyond terrify you? Have you used online curriculum such as UnLock Math in the past to help teach your older homeschool students? Don’t just take my word for how we found this to be. 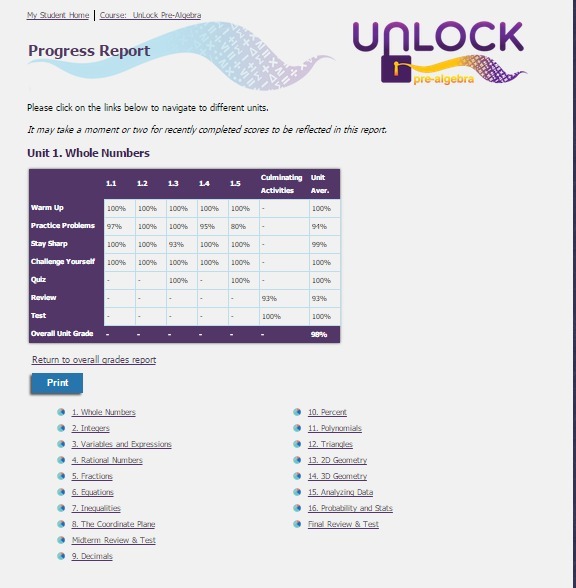 Visit the UnLock Math Review post on the Schoolhouse Review Crew website to see what other homeschooling parents thought about this and other self-paced courses.